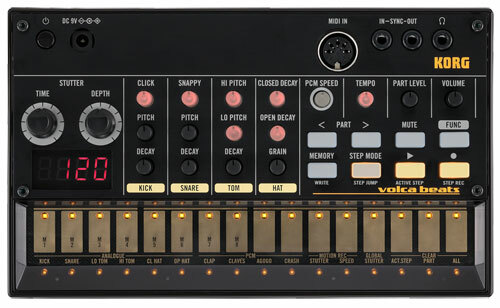 Who wants to pay $1500 for a TR-909? For about $950 you can have this. I makes my tummy turn! 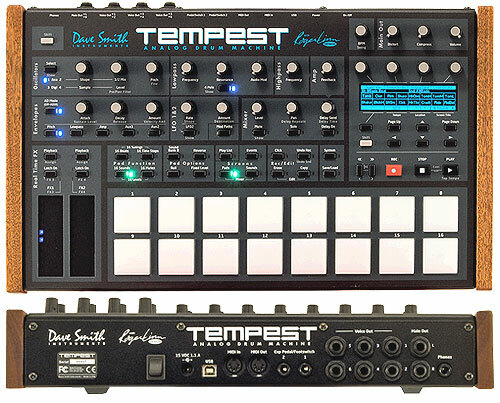 Has anyone compared this unit with the Novation DrumStation...? 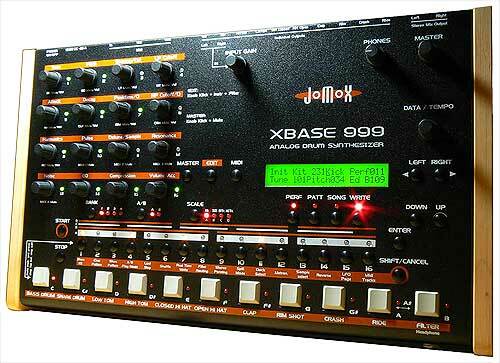 I'm looking for a decent MIDI drum module that's more versatile than 'just a x0x clone.... must have good MIDI control ! The MIDI control on this synth is superb. If you pop on over to the JoMoX site you can have a look see at the manual. I used to own a Drumstation before I moved on up to the Jomox. 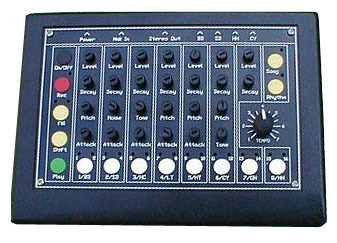 On controllabilty: The Jomox is every bit as programmable and controllable as the Drumstation, even without an array of knobs. 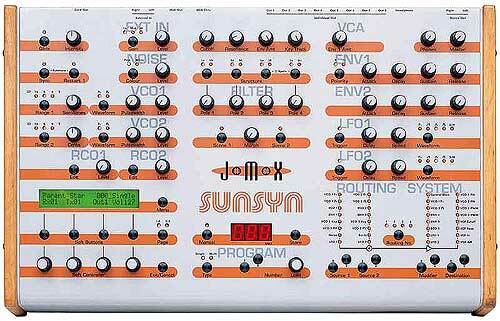 The Jomox has two syncable LFO's with an envelope and filter on every part. Very nice. 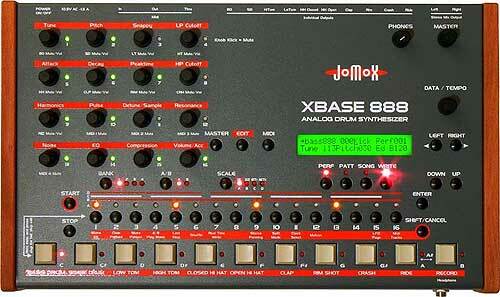 The Drumstation has some knobs and transmits data, but doesn't have the parameters per part of the Jomox. The kick drum itself has 10 on the Jomox. On sounds: Again, the Jomox has it. 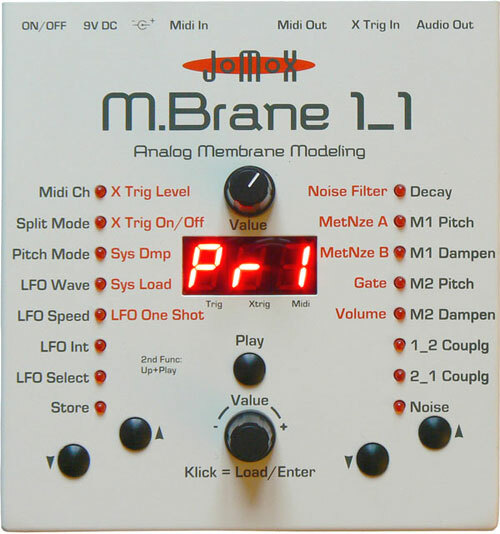 The analog envelope/filter combination give it a real solid punch over the whole module. Tha kick drum can boom longer and deeper than any Roland product and can shrink up as hard and tight as you want it. The sounds sets include programs modeled after the sounds of Frankie Bones, Richie Hawtin and 808 State among others. The sounds are based off of four kits, the "808", "909", "CR78" (hellyeah on that, what a great hip-hop box that is!) and a lives set, which ain't quite Alessis, but sounds pretty good. I wrangled my Jomox for $600 USD new...more likely you can get one for around $800, but worth every penny. There are also 10 individual outs on this pup, one fore each instrument. Handy little light that blinks with MIDI activity. Nice paint job, looks good in the rack. Run it with a Doepfer MAQ16/3 if you have it and set it to control your favorite parameters at 16th notes. very nice. 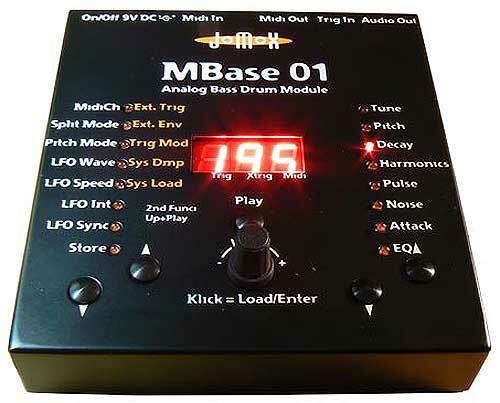 I am thinking about "upgrading" from a drumstation to an Airbase... Is this a good move?? Does anyone know if you can make the poly sounds mono? The AirBase is one of my favorite instruments (yes "instrument"), and I have all analog gear; with the filter, the LFO's, and MIDI controllers that control every parameter and with the ability to record all your tweaks, I cannot see anytime in the future where I will get rid of this machine. Only thing that would be better would be if you could pan the instruments on the way to the main outs--you have to use the individual outs to get a L/R mix--nevertheless, the sound and usability are #1 on my list and Jomox delivers on both! 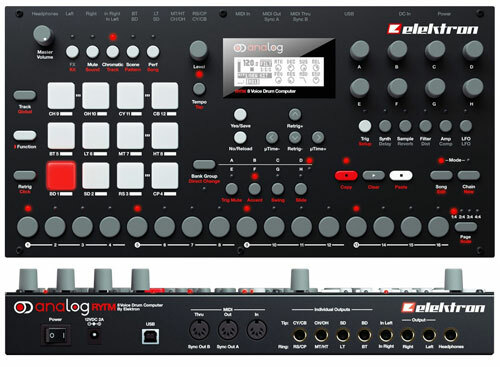 I've never owned a 909/808 etc., but why would you want those machines when this will emulate them both PERFECTLY plus provide an almost infinite amount of new drum and synthy-sounds?